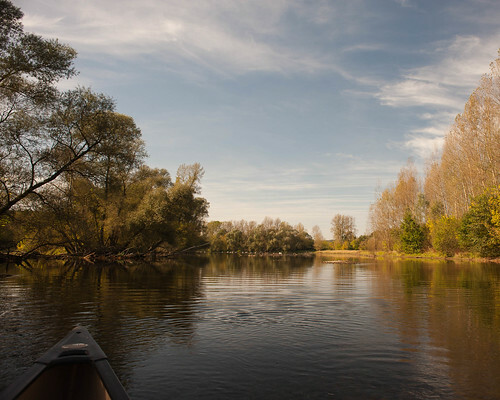 After a leisurely breakfast we returned to the canoes and began our day on the river. 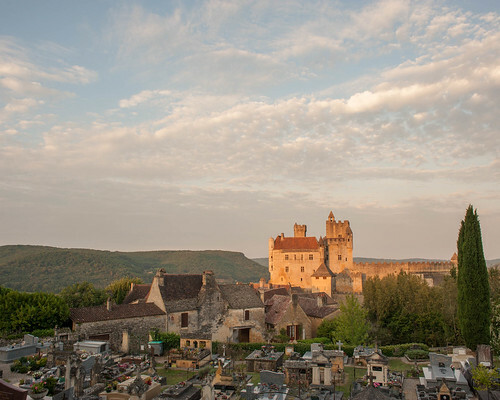 We will be visiting castles and villages along the way until we get to our next hotel at Beynac. First of all we slide along the river until we reach the cliff and bridge at Vitrac. 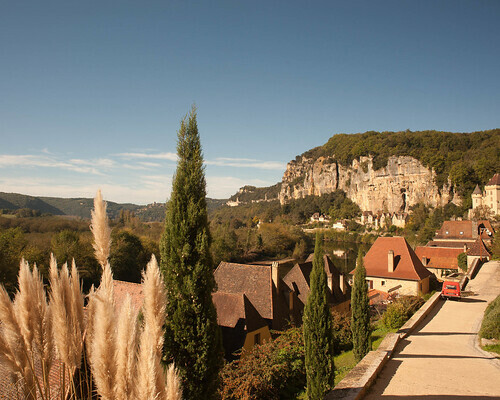 Then it was the long straight stretch with the village of Domme looming on the cliff ahead of us. 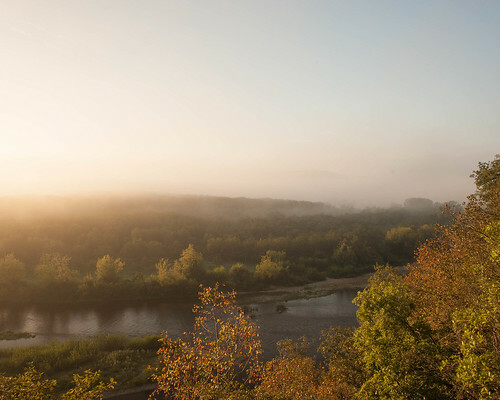 A layer of mist hung over the river but we could already tell that it was going to be another hot day. After coming under the Domme cliff we arrived at the Cenac bridge and a stretch of bumpy water taking us along to Roque-Gageac. We admired the glistening white cliffs here as we rounded the bend and got our first view of the village. At Roque-Gageac we pulled over at a canoe outfitters as some restoration work was going on at the public place. Since a major cliff-fall at the village a couple of years ago they have rebuilt the river wall and road in front of the village. It looks smart too. 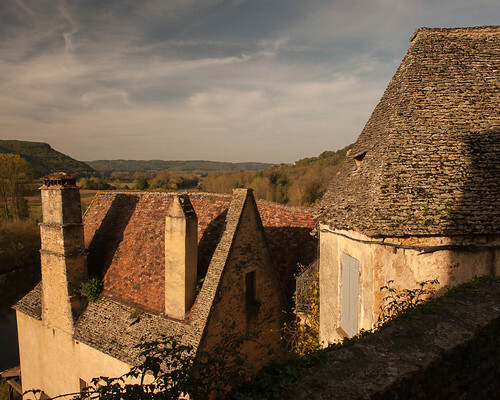 The only downside is that some parts of the higher village are now permanently closed off – you can no longer walk up to the troglodyte cave dwellings above the village. Some of the cliffs are now also covered with a metal mesh. Steve and I did take the time to walk around the village on this visit, something I haven’t done myself for quite a while. Some of the footpaths around the back of the village are also impassable these days – as being deemed unsafe. We still managed to see most of it though. 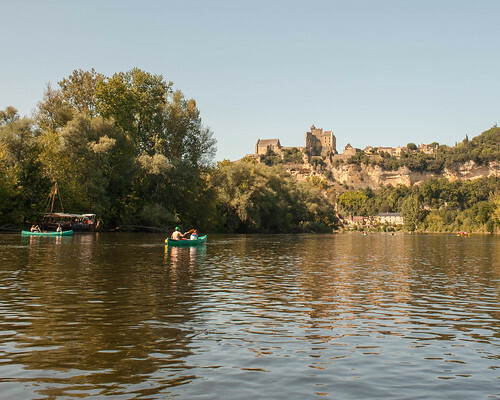 After some refreshments in the hot sun we got back in the boats to start the next leg of the paddle down to Castelnaud – not forgetting to look back at the picturesque Roque-Gageac as we left. 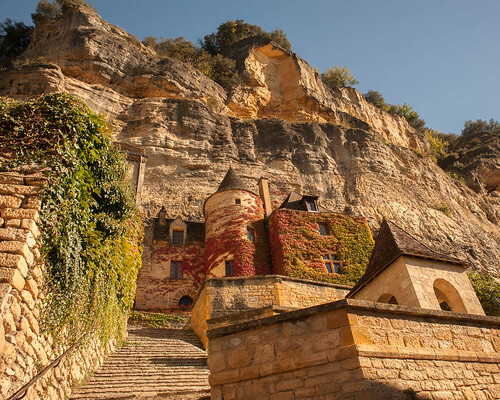 In no time at all we were arriving at Castelnaud where we took our guests up the hill so they could visit the splendid castle. 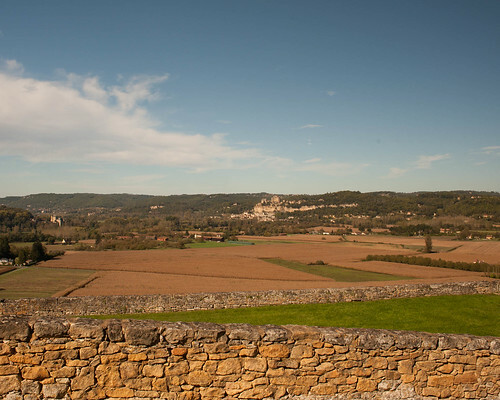 As we had plenty of time we also took our guests to visit the Chateau Marqueyssac which sits opposite the castle on the other side of the Dordogne. This was built to spy on the first castle but is now home to an extravagant and formal topiary garden. We sat down and had our picnic lunch here too whilst admiring the views over the countryside. We walked back to the river from here visiting a cave on the way where we tasted some of the local wines. 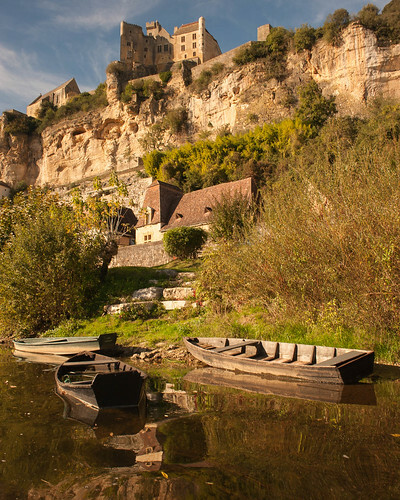 At the river bank our canoes we still there and we were able to paddle the last stretch of the day down to Beynac. Just another half-an-hour on the water. We soon approached the canoe ramp at the end of town and pulled ourselves ashore. Our hotel is just a step across the street so in no time at all we were sitting in the sun having a beer and reflecting on our day on the river. In the morning we walked up through the village to visit the castle as soon as it opened its doors. 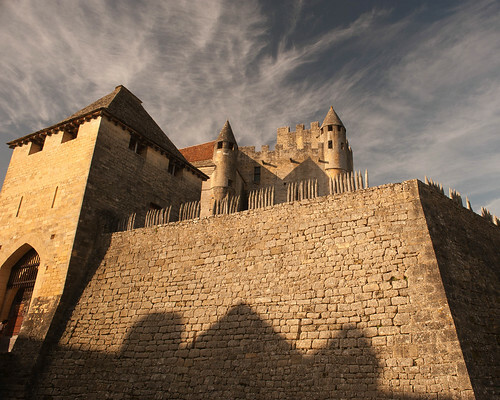 This castle has quite a different feel from it than the one at Castelnaud. They were mortal enemies during the 100 Years War between France and England. 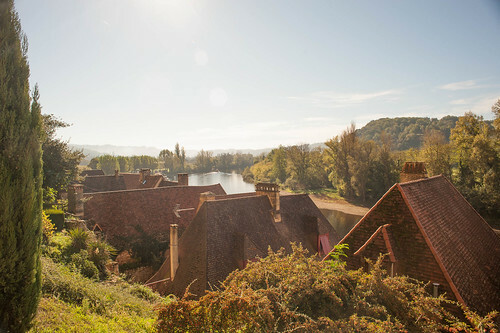 It was a very pleasant walk in the early morning sunshine as we descended back down the village to the river-side where we began to make preparations for our last day on the river. 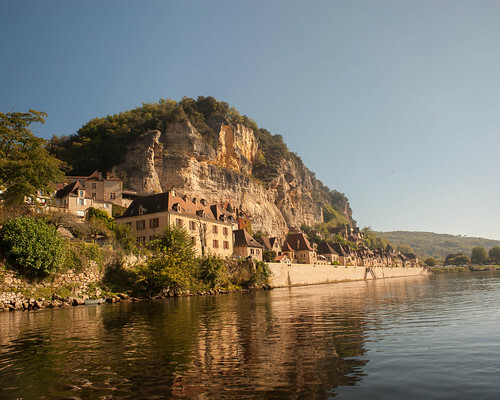 We slipped into the water and immediately took the passage on the right side of the island just below Beynac. This is the quieter, slower side and I always hope to see something. Perhaps a Nutria gliding into the water or some Eagle Owls roosting. 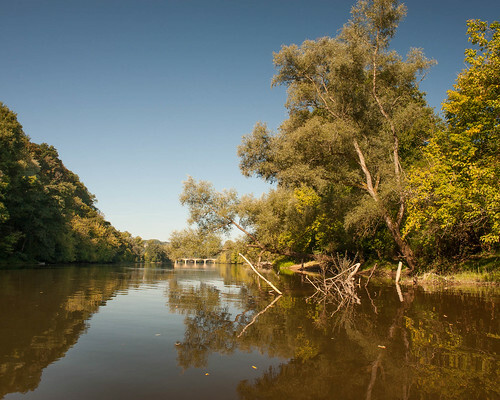 This island also has a large Heronry in the centre which can have dozens of birds in the spring-time. Today we see a couple of pairs of Swans and some quite grown-up cygnets. 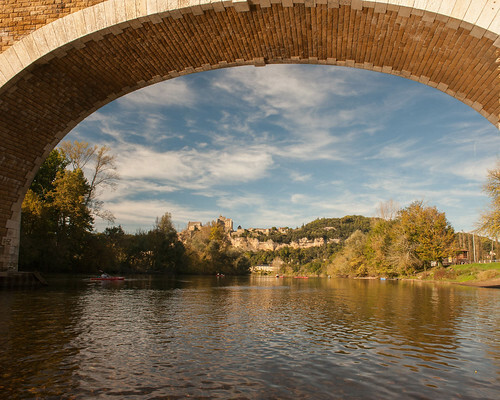 As soon as we are back in the main stream we are under the railway bridge with the Chateau Milandes in the distance. In fifteen minutes we approach the ramp here and pull up our canoes for a visit. 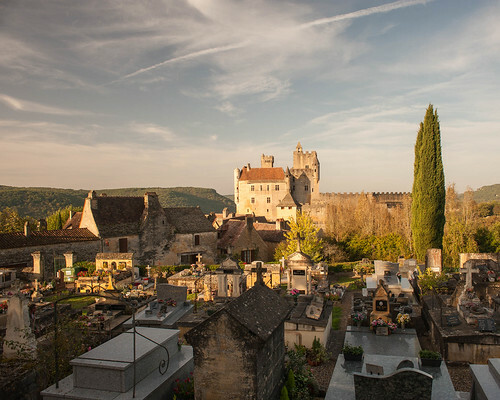 This is the place made famous by Josephine Baker and it is interesting to visit the castle and gardens and learn more about her and her life. After our visit we had our picnic lunch at the JB memorial in the lower village which has tables in the shade of a large tree. It was then time to begin our last paddle by continuing on down to Siorac. Our guests Nancy &amp; Mitch were in a bit of a hurry so they scootered off whilst Linda and I took every opportunity to explore every island and to take our time on the river. It was a beautiful day for it and though we got into some shallow scrapes as we meandered down the path less travelled we had a very enjoyable afternoon. We took a width berth at this place where we saw almost 40 swans gathered in one place. 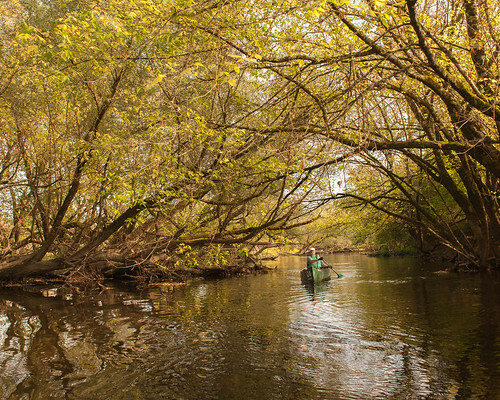 It was very beautiful under the canopy of the Autumn leaves in some of the narrower channels. At some places I had to get out and drag the canoe ‘African Queen‘ style through the shallower sections. It was fun though and I think Linda enjoyed the Katherine Hepburn role. 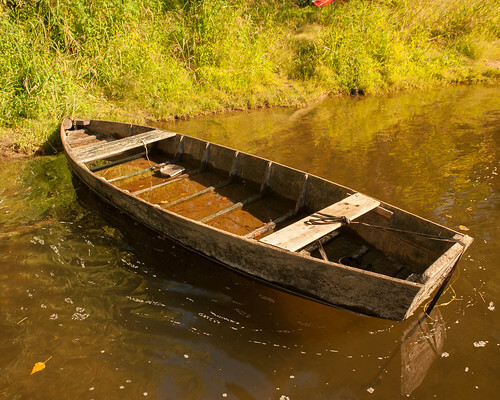 In the end our days on the river were finished and we had to pull up our canoes for a final time. 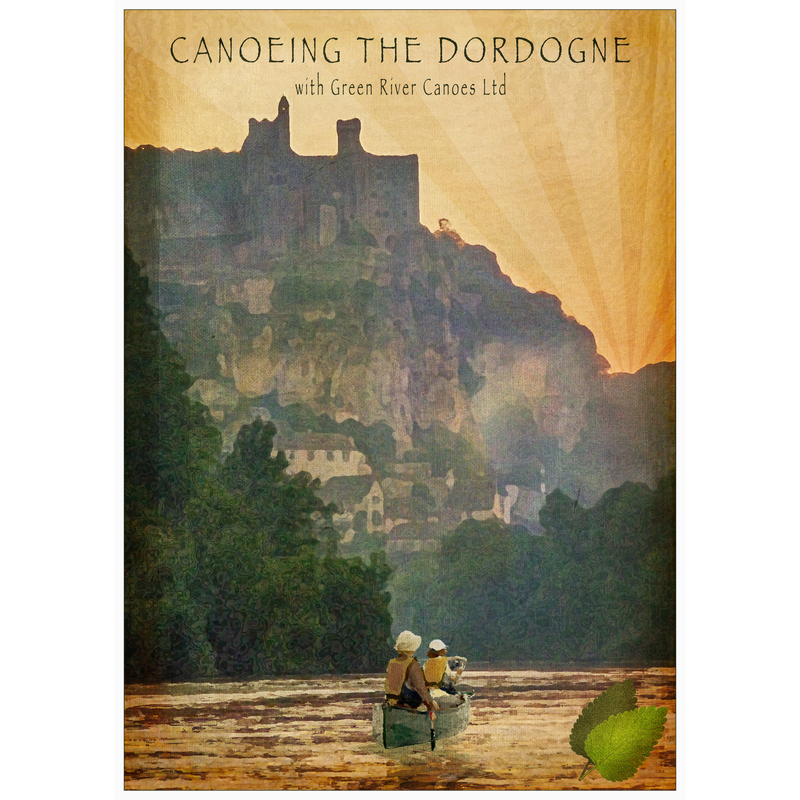 This entry was posted in Inn-to-Inn Guided Canoe Trips and tagged 2015, Beynac, Canoe, canoeing, Castelnaud, Cenac, Dordogne, France, Green River Canoes, Holiday, Inn-to-Inn Guided Canoe Trips, Perigord, Roque-Gageac, Siorac, Trip, Vacation, Vitrac on January 8, 2015 by Green River Canoes Ltd.
A mishap this morning meant we missed each other for our pre-breakfast walk. Bob was apparently somewhere trying to get a wi-fi connection. I just walked a small loop around the villages up to Pech Malet where we usually stay and around the castle in the early misty light. I also went down the cliff path to make sure the canoe was still there. It was. At breakfast we chatted to a couple from New Zealand who were on a driving holiday. 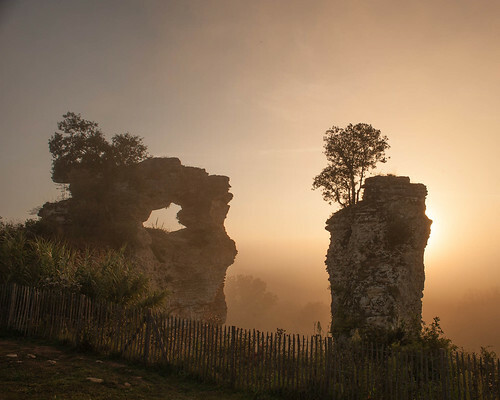 I suggested to them that they might visit the Cele valley an hours drive further south and told them about the charms of the place and the cave paintings at Pech Merle. I also told them about my friend Richard &amp; Helen at the Metarie Basse in that region. A great place to stay. I had an email later to tell me that they had actually taken up my advice. I was pleased with that. After breakfast we packed and carried our gear back down to the river. 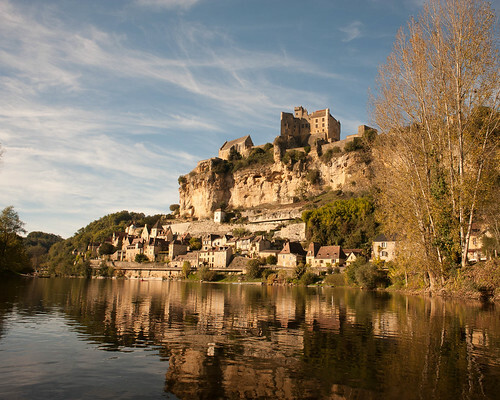 Ahead of us we had a day of visiting small riverside towns and huge castles before arriving at Beynac. We slipped into the stream and began by disturbing the ducks bobbing about the place. As usual we were alone on the river with not even a fisherman to be seen. After leaving the castle and casting a long look back we tackled a series of three islands as we came around the bend. We paddled quietly down the narrow side of the first two and then expanded some effort to cross channels to the quicker water on the far side of the third island. This was just to enjoy the choppy water. 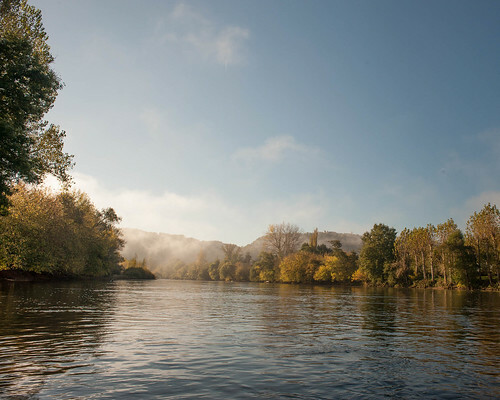 After that we took the quiet route again at the island opposite the Plage de Soleil and generally meandered about the river as we saw fit. As usual herons lazily lifted into the air in front of us and the ducks made various complaints. 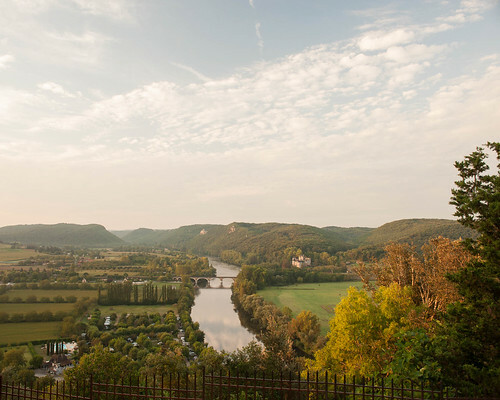 We drifted under the cliff at Vitrac bridge and then took the long straight where we could see the village of Domme towering above the river. 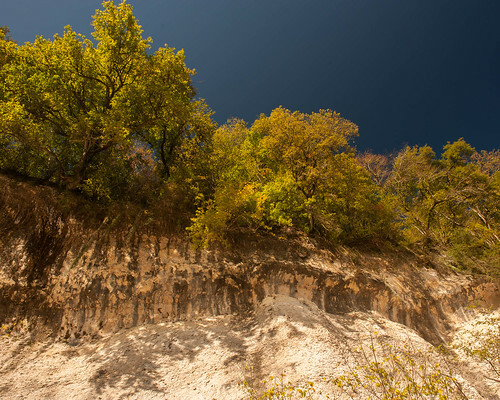 I’ve never managed to visit this place as it is a stiff and long climb from the river bank. We then approached the bridge at Cenac. 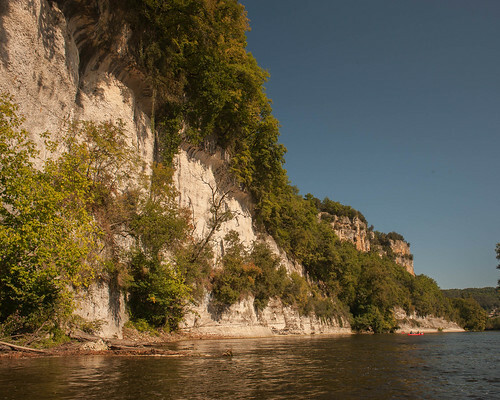 This is where Christophe has his canoe base for Canoe Raid. Always feel a bit sad here as we used to stop and visit Christophe’s father George and sometimes have a snifter of Port or Pastis. The river speeds up a little at this point and on the next stretch it gets a bit bouncy and you have to negotiate some rock fields. It’s no fun hitting a rock head-on and being catapulted to the front of the boat! Before long we approach the high white cliffs as the river takes a right-angled bend and approaches Roque-Gageac. 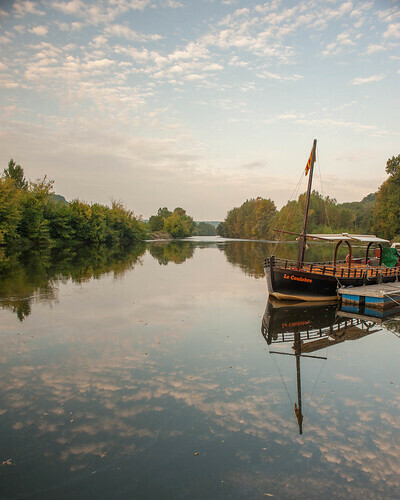 As we come into town we have to dodge the famous Gabarre tourist boats which are replicas of the trading boats that used to take the wine barrels downstream to Bordeaux. If they are going fast enough we can have some fun on the bow wave. We pull up in the small town for some refreshments. Sometimes a small market is running, but not today. Bob goes off to run around the town whilst I sit down for a beer. The narrow streets off the only road through the village are an intricate maze of steps and paths. Suitably refreshed we re-embark for the next leg of the journey down to Castelnaud. 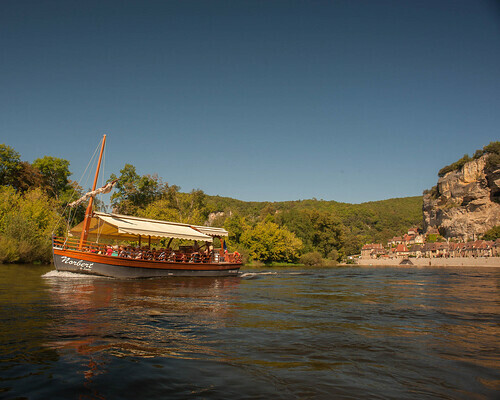 It only takes us half an hour but we spend the time spinning the boat around to admire the view in both directions as we leave Roque-Gageac and approach Castelnaud. 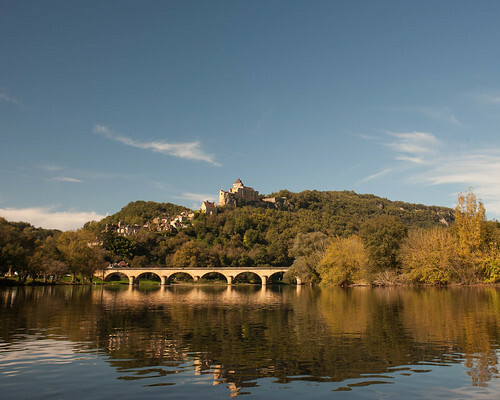 We also make sure that we are on river left so that we can fully appreciate the size and grandeur of the castle at Castelnaud. 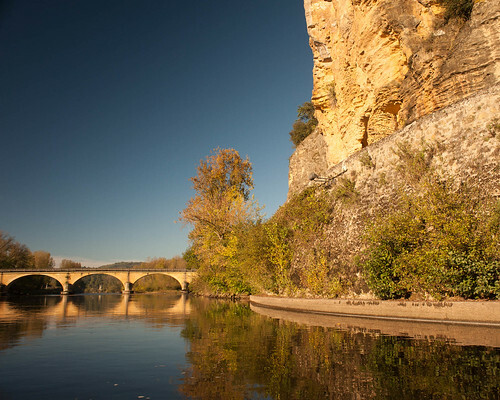 After we pull the canoe up the beach at Castelnaud we take a break for lunch – the usual kind of picnic. I then show Bob the footpath that leads up to the castle on an ancient Roman road and then leave him to to visit it. 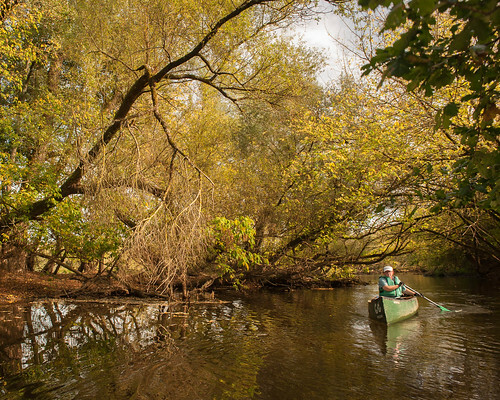 I, meanwhile, return to the riverbank to watch the canoe and have a pleasant doze in the sun. 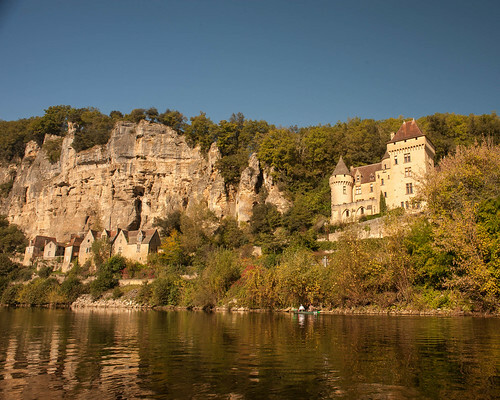 Some hours later we return to the river for the last leg of the day as we paddle the 30 minutes down to Beynac. 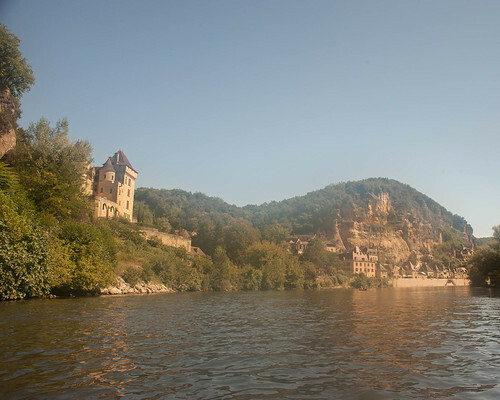 We slip past the castle under the imposing cliff and arrive at the boat ramp at the end of town. 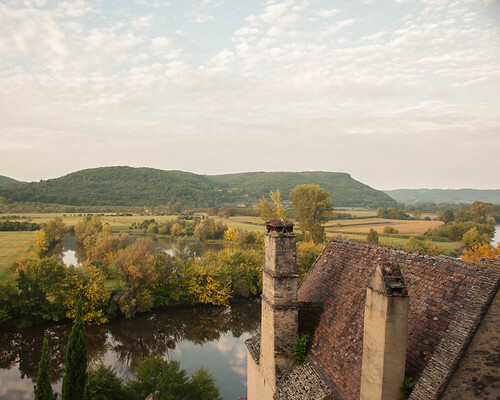 We put our canoe out of the way on a grassy bank and slip into the Hotel Chateau where we are staying tonight. In the late afternoon we have time for a quick dip in the pool before changing for dinner on the terrace overlooking the river. In the morning we manage not to get confused and go for our regular pre-breakfast walk. We walk along the river front before taking a back road up to the castle. Unfortunately I miss a turning onto a footpath – when I’m back here in October I look more carefully and can see that a sign has been deliberately broken that points the way. Anyway today we just follow the road up the castle and from there we can admire the views up and down the valley. We then take the usual route down through the village on the cobbled lanes enjoying the views over the roof-tops as we go. After breakfast we re-consider our plans. We have no hotel booked for tonight anywhere downstream. I had thought we might stay in Siorac. 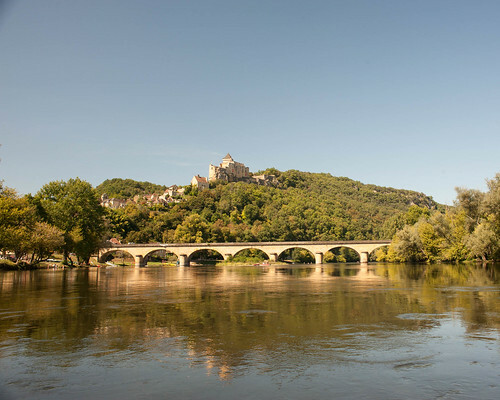 My plans are to return to Paris but Bob has to get to the rendezvous on the Loire to begin his cycling holiday. 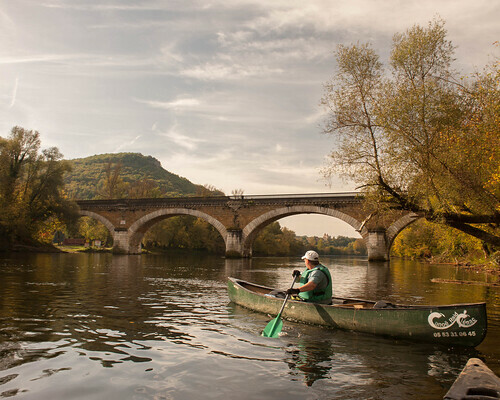 We decide that if possible we will paddle down to Siorac as originally planned but then catch a train late this afternoon and get as far as Limoges, stay the night there, and then go our separate ways the following morning. In view of this Bob decided to forgo a visit to Beynac Castle as it doesn’t open until 10am anyway. Off we go then for our last day on the river. 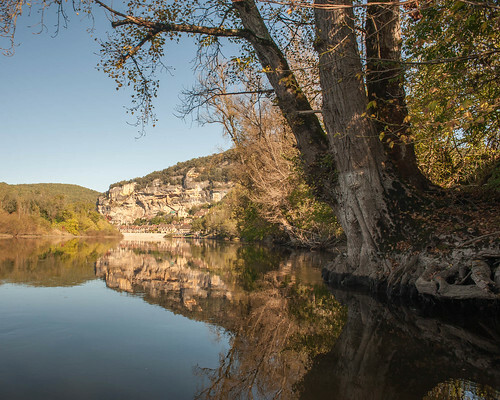 For some reason I don’t have many photographs of this last day on the river, but we cruised out of Beynac and took the right-most branch at the island there in the hope of seeing some Nutrias. We didn’t – though we did see some swans – we were careful to keep our distance. In 20 minutes or so we arrived at the take-out for the Cahteau Milandes, famous for the Josephine Baker story. We weren’t that rushed so Bob had some time to visit the chateau before we continued. 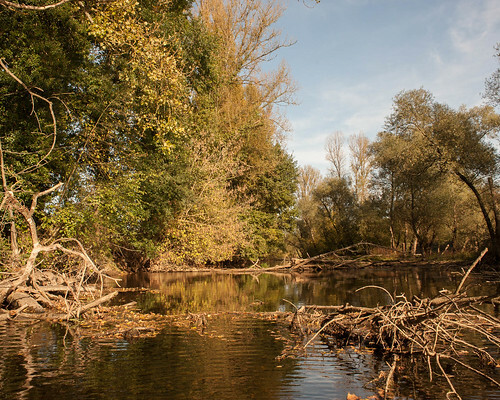 We then meandered down the river dodging in and out of various islands and sometimes taking the fast water as we went. It was a very enjoyable day. I like this stretch. 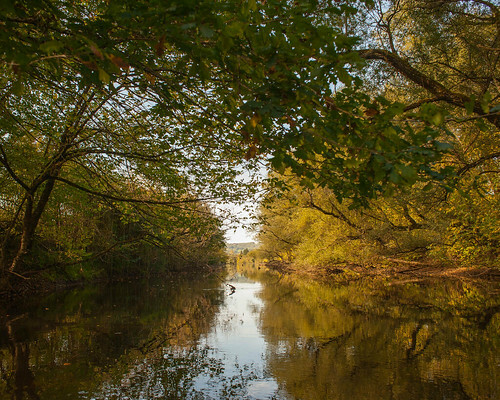 You almost always have the river to yourself. Finally however we reached the bridge at Siorac and pulled over at the beach at the little hut owned by the Canoe Raid outfitters. Unfortunately they could not rendezvous with us as they had other clients to deal with but they had left Bob’s luggage in the hut and all we had to do was break-in and get it! (Not really – they’d left it open). We found somewhere to have lunch and then we traipsed up through the village to the railway station. A few minutes later the little train rattled along and we jumped in. The end of a fine trip. Thanks Bob. 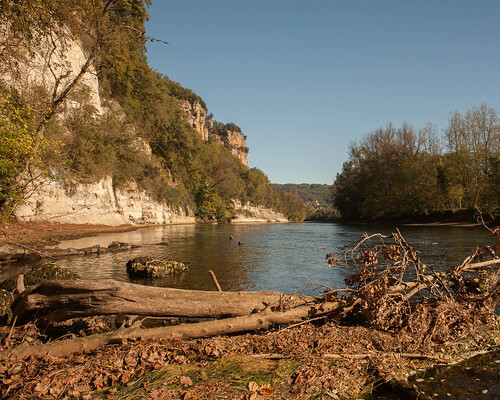 This entry was posted in Inn-to-Inn Guided Canoe Trips and tagged 2015, Beynac, Canoe, canoeing, Castelnaud, Dordogne, France, Green River Canoes, Holiday, Inn-to-Inn Guided Canoe Trips, Perigord, Roque-Gageac, Siorac, Trip, Vacation on January 5, 2015 by Green River Canoes Ltd.
Off for an early start on the river. A long day ahead and a long way to go. I love sliding onto the water before the sun is up. The mist is rolling on the water like vaporous tumbleweed, and the water-fowl, still sleepy, disappear and re-appear. This is beautiful on an autumn morning. The canoe glides over the water which always seems to be unnaturally calm at the early hour. 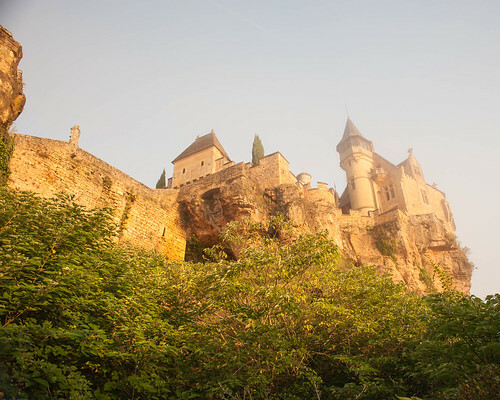 On this stretch of the Dordogne in France, if you time your launch correctly, you can look back on the sun rising over the misty Castle Beynac, and turning around can paddle towards the spires and towers of the Chateau Milandes spearing above the mist. Magical times. 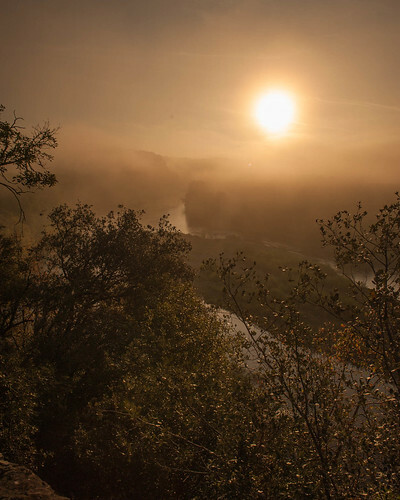 This entry was posted in 28 Reasons to go Canoeing and tagged Beynac, Canoe, dawn, Dordogne, mist, morning, River, sunrise on February 15, 2014 by Green River Canoes Ltd.